If your operation requires you to transport your products throughout your facility, whether it’s before, during or after assembly, then you’re almost assuredly in the market for a high-speed, versatile transporting solution. In that case, we would encourage you to investigate the many benefits offered by the MCE tabletop conveyor. 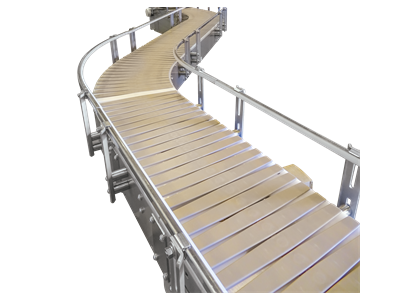 Designed as a complete conveyor system, the MCE tabletop conveyor is built around a prefabricated modular stock system, allowing it to be adapted to a massive range of applications. Utilized in a wide range of industries, such as consumer packaging, personal care, automotive, food packaging, medical and electronics, the conveyor system is preferred because of its ability to be built to meet strict clean room conditions, as well as its proven reliability and ruggedness. The main reason that the MCE tabletop conveyor is considered one of the most versatile available is that it is capable of transporting your products through various elevation and directional changes. Because of this, the conveyor is ideal for facilities where space is at a premium or where unusual layouts require novel, adaptable solutions. For example, if your products need to move from a labeling station, through a narrow hallway, around a tight corner and then down to a lower level for packing, the tabletop conveyor would be capable of making all of those transitions and getting your products where they need to go. At Technical Packaging Systems, we serve the packaging and material handling needs of nearly every industry. Whether you’re operating in the food, pharmaceutical, automotive, transportation or chemical industry, we have the knowledge necessary to design and implement an efficient, versatile packaging line. So, if you’ve been looking for a customizable, adaptable and extremely versatile transporting solution, contact us today to discuss how you can take advantage of a new tabletop conveyor from MCE.